Laminated glass is produced by permanently bonding too pieces of glass together with an interlayer or resin. The interlay acts to hold the glass together in the event of a breakage. Laminated curved glass can be made up of any combination of glass types. 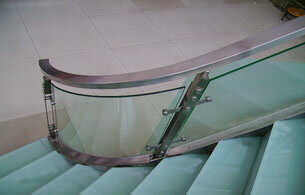 Laminated glass is custom made for each project and as such can be produced to meet a variety of designs; and Glass Railings Pilippines is using Laminated glass mostly in Canopy Glass Projects. Genaral application for Curved or Bent Glass are windows, doors, balustrades, facade systems, shopfronts, partitions, showerscreens, display cases, food display units, splashbacks, wall panelling, pool fences, facade systems, shower enclosure, glass railing, balcony railing, food cart display, glass shelves. Toughened glass is made by heating annealed glass to approximately 700 degrees Celsius then cooling the outer surfaces rapidly. This process makes the glass very strong and shock resistant thus more durable. Bent & Curved Glass uses this toughening technique though a horizontal tempering furnace while bending the glass to specific shapes. It is one of the few curved toughening furnaces in Philippines and it is the only one with a tight radius capabilities, it provides a wide range of applications in architectural, commercial and residential installations. Following is our curved toughening specifications. Please contact us regarding the viability of using bent glass in your next project. Sometimes taken for granted, a staircase isn't just a link between two floors — it's a major architectural feature that turns an ordinary entryway into an elegant grand entrance. Although it is often basic and generic, your staircase can help define your style and showcase your decor. By adding a unique staircase design, ornate railing and interesting materials, you can update the overall look to ensure it's something you're proud of. What kind of staircase material should I use? Your staircase style should blend in with the rest of your house, so don't try to mix two dramatically different tones, like traditional and modern. Carpet and stone are popular traditional materials, while metal and floating wood steps are trendier options. You can also get creative with the railing. An industrial-style rail can help make wood treads contemporary, or an ornate metal railing can help enhance the mediterranean feel. In the end, even though appearance is important, you should first and foremost think about function. If you have young kids, an open railing or hard metal steps can become a safety hazard, while dogs and common household traffic might scratch up wood. What kind of staircase works for me? When deciding what staircase to install, your top consideration should be space. Not every type fits in every home: A double-sided staircase only works in large entryways, so for a smaller space, you should opt for a straight or L-shaped one instead. 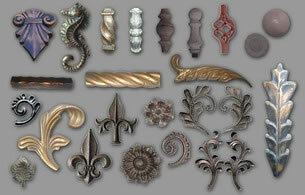 After determining function, you can then narrow down your options based on overall appearance. Elliptical or curved stairs offer a touch of elegance, while a spiral set is a more quirky, fun approach (though not necessarily all that practical). Manufacturing curved glass is a time-consuming, highly specialised job. You could almost say it’s a ‘pane’ to produce. Workers cut the sheet of glass to size and then clean and polish it, using a UV lamp to check for dust or impurities (any rogue particles would cause the glass to crack or shatter). 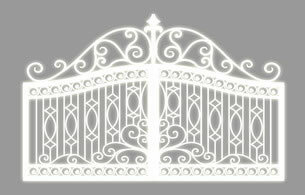 They construct a steel mould shaped to the curve radius and dimensions of the desired piece. To stop the pane sticking to the mould, the glass is painted with a mixture of detergent and calcium carbonate. Then, it is placed on the mould and loaded into the kiln. The manufacturers crank up the heat to 700°C, hot enough to loosen the bonds between the silica molecules so that the glass starts to soften and bend to the profile of the mould. Once in shape, the glass is gradually cooled over a period of about two hours. 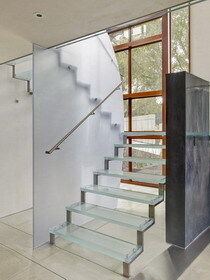 Tempered Glass Railing Systems are unlike anything else on the market. This is by far the safest frameless glass railing system sold today. It meets the strictest international building code requirements for loads and impacts and is also completely dry glazed. That means the systems will not delaminate, creep and or discolor over time. With three tempered laminated glass thickness's to choose from this system will not only satisfy your needs for safety and security it will give you all glass look you want. Tempered Glass is 4 times stronger than annealed glass and when it breaks is not causes wounds not like annealed glass or ordinary glass.